Lifetime Products brings its premier design and ingenuity to the outdoor and recreational market with their commercial 8 ft folding picnic table. 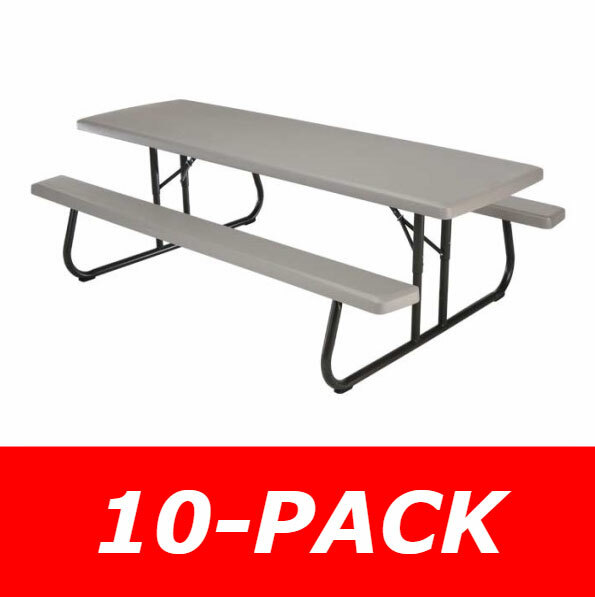 Very spacious, roomy design, these picnic tables are ideal for campgrounds, restaurants, and parks. 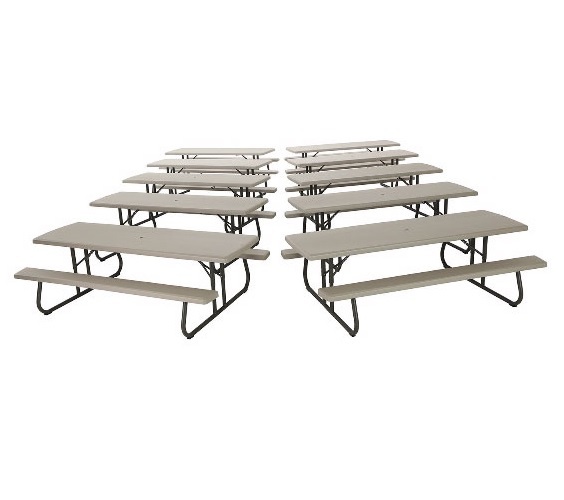 These folding picnic tables are made with lightweight high-density polyethylene plastic (HDPE) while maintaining great strength and durability with their complete steel framing. These picnic tables are great for indoor and outdoor use. They also come umbrella ready (i.e. a hole is ready to be knocked out in the table) so you can have fun all summer long, while being shaded for added relaxation. HDPE is developed to resist harmful UV rays from the sun that would cause other plastics to fade, crack, or peel. 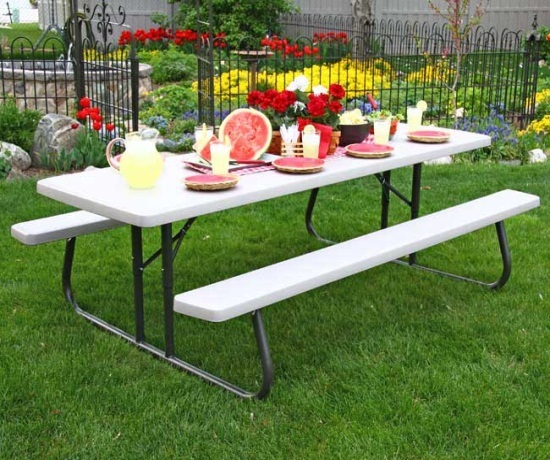 This combined with powder coated steel to prevent rusting, makes these folding picnic tables long lasting. To back up the superb construction of these picnic tables, Lifetime Products offers a 2 year factory warranty. 8 ft. table generally seats 8 adults comfortably. Easily maintained- stain resistant table top. Putty Colored Table top with bronze steel framing. HDPE table top will not fade, crack, or peel in the sunlight. Table top is 96 inches x 30 inches. Each table weighs about 105 lbs. Umbrella ready for your convenience. 2 year Factory Warranty on each table. Also see our other Lifetime Folding Picnic Tables. We were very pleased with the construction of the tables. They are built as sturdy as we had hoped. Also, they were delivered in a very timely manner. Thank you. This is a great family table. WE LOVE it! WE eat on it outside in the summer and it is very easy to clean. Great Table Lifetime. This table is perfect. My small family doesn't fill it very often, but when friends and family come over, I never have to worry about where everyone will sit. Love that it can fold flat for convient storage. We purchased this table a couple of years ago and have put it through the ringer! We have hauled up to reunions, hunting camps, camping trips and many church activities. Light enough to transport easily but strong enough to take a beating. We love it! We bought this table for use at our mountain cabin. We have had it for several years and it sits out on the deck in the weather year around. The table has had a lot of hard use and weather exposure and is sturdy and as good as the day we bought it. Great product! Just set unit up yesterday. Some assembly required but easy to do. 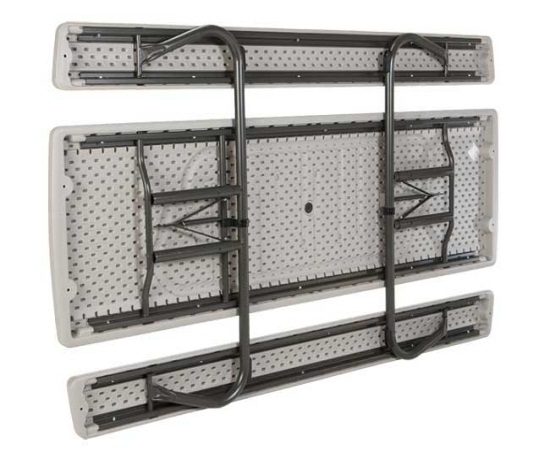 Would be helpful to have two people do setup. Saw the 6 unit at Sam's Club and immediately liked the appearance and construction. Searched numerous on line sites and Competitive Edge beat them all. Watch out for shipping cost other outlets may not make clear. Packaging was good enough to prevent any damage from trucking company. A small semi made the delivery to our residence. Time will tell how the plastic withstands the direct sun over a period of years. That is the reason I can only give it 4 stars at this time. Great Top and Seats. Very poor metal parts below. We loved our picnic table, however, after being exposed to Florida weather during the 3 5-6 month winter seasons (we were snowbirds until Nov. 2013) the metal parts have been severely rusted out. So much for powder protected metal. Even the snap locks on the main legs have frozen; sprayed each season with WD40 or 3in1 Penetrating spray or Blast Lubricant. Finally, have been unable to find replacement metal bottoms; told to just buy another $400 +/- unit buy the local sellers, i.e. Lowes, Home Depot or Big Lots. Not a happy camper, at least with a wood table I could have sealed it or replaced the parts myself one piece at a time; had my last wooden picnic table 30 years and never replace any wood, only had to seal it every two years or so and sometime put in additional screws. Q: Can one person move these by themselves? A: It's definitely easier with two people. One strong person can move one table, but generally it requires two people. We recommend two people. 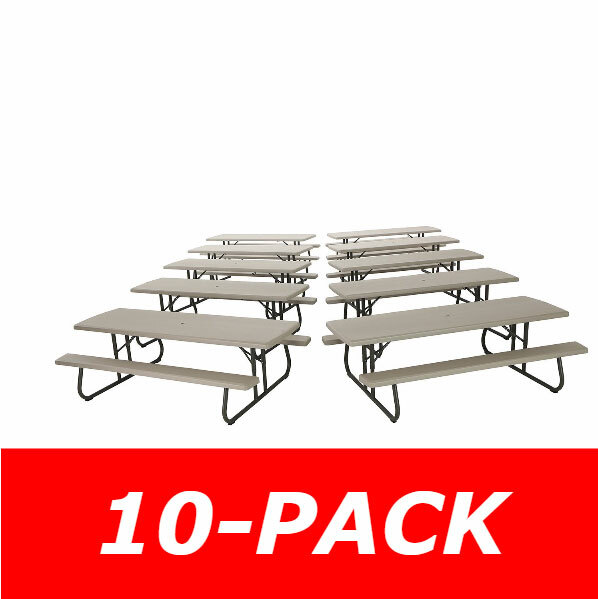 Shipping: Orders for the 880123 Lifetime 8' Folding Picnic Tables 10-Pack generally leave the warehouse the next business day. Dimensions: 96" x 48" x 40"